This issue is co-produced by WorkMethod, Paris, with the support of American Center Foundation, and Frac Ile-de-France/Le Plateau, Paris. It has been produced in the context of “Société Anonyme”, a project curated by Thomas Boutoux, Natasa Petresin and François Piron, 2007. Mention of the avant-garde today is met with a great deal of incredulity. Where is the avant-garde? I don’t see it, point it out to me; I am unaware of any groups of artists who operate in ways that might be described as an ”ism” or a movement; art today is multiple and plural in its forms and effects, driven by the spectacle and the museum and not by revolutionary ideology; I see no radical convergence between art, technology and social transformation; art has long thrown off its utopian zeal and the mythos of human emancipation. Forget the avant-garde! Over the last few years, a number of artists have succeeded in both realizing and finding the theoretical grounding for a variety of works which allows us to speak of a new situation in art. These projects have found points of connection between art, new technologies, and the global movement against neo-liberal capitalism. The lineages of this interest in political art can be traced back to Documenta 10 (1997) and coincides with the emergence of the ‘movement of movements’ which erupted onto the political horizon in Seattle in 1999 – an event which, it can be argued, has crystallised a new political subject (named the Multitude by Hardt and Negri’s Empire published in 2000). This situation has subsequently been manifested through a variety of cultural projects whose critical stance towards the process of capitalist globalisation and emphasis on the principles of self-organisation, self-publishing and collectivity has evoked the idea of a return to ‘the political’ in art. Today, any attempt to actualize the archive of the left avant-garde can have only one political meaning. Namely: to analyze a conjuncture almost unprecedented in history, when art and politics from the left joined forces to realize the greatest social revolution ever imagined, its impossibility comparable to that of truly rational beings finally appearing in the world. In what was ultimately a failure, they attempted to reinforce political gains in new forms of everyday life, creating hitherto unimagined sensibilities. An understanding of art as an anthropological experience of images defined by unconscious non-representative mimetic procedures (or mimesis immanent to the artwork)  would allow us to see this phenomenon as a model of human life that is immediate and no longer subordinate to any subject-centered ideology, at least to the degree to which it becomes characteristic of both the art work and broader socio-historical truth procedures (Alain Badiou). Magun: The question we would like to discuss with you today is the connection between aesthetics and politics. Is there a specific type of art that would be both productive and relevant to the contemporary political and cultural situation? Our hypothesis is that the avant-garde – both as a phenomenon and a notion – could be important for us today. This view comes out of our historical situation, which was shaped by the constitutive moment of perestroika. As democratic mobilization challenged the authoritarian and corrupt power of the Soviet state, there was a major revival of interest in both Western modernism (not just Kafka and Joyce, but also Pollock, etc.) and the Soviet avant-garde art of the 1920-30s; what seemed important was the conjunction of this type of art with political emancipation. What do you think? Is the avant-garde is still usable as a notion? Ranciére: What strikes me is precisely that your relation to avant-gardist art was mediated through the democratic aspirations of the time of the perestroika. This means that it took its relevance in a certain present as a thing of the past. The question is: what thing and what past exactly? It seems to me that there are two concepts of avant-garde art and of its political effect. There is the idea of avant-garde art as an art intentionally designed to create new forms of life. Such was the art of the Russian futurists and constructivists, the art of El Lissitsky , Rodtchenko and their likes. They were people who really had a project to change the world, using certain materials and certain forms. Avant-garde art, in that way, was destined to create a new fabric of common sensible life, erasing the very difference between the artistic sphere and the political sphere. When you mention Kafka, Joyce or Pollock, it is not the same at all. What they have in common with the former is the rejection of standard representational art. But they did not want to create new forms of life, they did not want to merge art and politics. In this case, the political effect of art is something like what you mentioned: a transformation of our ways of feeling and thinking, the construction of a new sensorium. But this new sensorium is not the consequence of a desire to create new forms of collective experience. Instead it is the very break between the contexts in which Joyce or Kafka created and the context in which you read them that gave them their ‘political’ relevance. So, I would say, first, that the idea of the avant-garde entails two different things, two different ideas of the connection between the artistic and the political, second, that the concept of the avant-garde that you had in mind at that time was a retrospective construction. 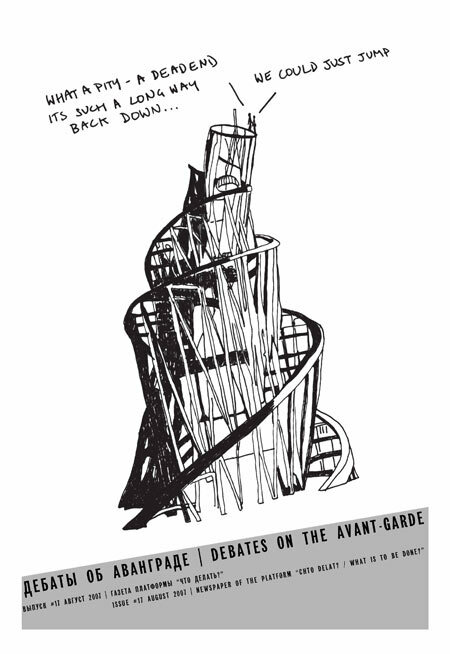 As a matter of fact, avant-gardism and modernism as they are used in contemporary debates are retrospective constructions that are supposed to allow us to have it both ways: to have both the collective impulse and aspiration to a new life and the separating effect of the aesthetic break. dr: 01:54:23 Hey Lyosha! Busy? ap: 01:55:06 Nothing special – Watching Futurama, to be honest. And you? dr: 01:55:10 Re-reading all kinds of stuff on our subject in old ‘October,’ but then I started reading Virgil’s Georgics about the bees. ap: 01:57:25 That’s a noble way of spending your time – Why bees? Are there some special avant-garde bees? Brian Holmes /// Risk of the New Vanguards? We are confronted today with the emergence of a global society, a society of constant mobility and interchange, marked by a violent paradox: just when this world begins to come together, it begins to fall apart, in a double movement. This is a risk society that exalts and rewards creativity, with the result that it is saturated in art. It is exemplified on the subjective level by the so-called creative class, it runs on invention power, and innovation has become its productive norm. For those very reasons, it denies the existence of artistic vanguards, just as it denies and represses anything like a political avant-garde. The globalizing process itself is the only vanguard. Let’s try to look beyond that double denial of agency. How has the development, with a language and formal structure culled from the values of research and academia, influenced an aesthetically based context such as art? On what level or levels should the new products associated with and created in the field of art be interpreted? Are not, for instance, many of the usual seminars deceptively similar to performances or happenings? Do not the archives that have started to pop up within various art institutions often resemble installations rather than actual records of documents?